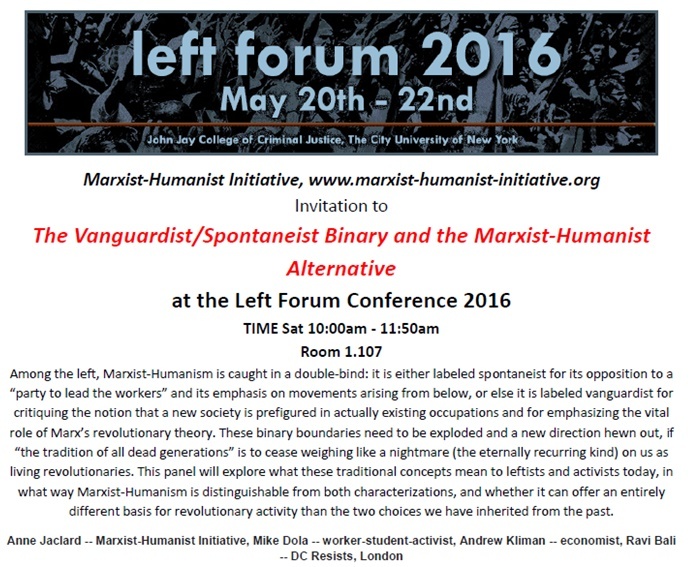 MHI will present a panel at Left Forum 2016 entitled “The Vanguardist/Spontaneist Binary and the Marxist-Humanist Alternative.” Left Forum, the largest left academic conference in the U.S., will take place May 20-22 at John Jay College, 860 11th Avenue in New York City. Our panel will be on Saturday May 21, 2016 at 10:00 a.m. (Panel Session 1 of the conference) in Room 1.107. You will do best to register in advance and check in early so you can get there on time. This panel tackles the broad subject of how to transcend or overcome capitalism from the perspective of economics, history, and worker revolt. Participants include Terry Tapp, author of A Serf’s Journal, the radical journalist Anne Jaclard, Andrew Kliman, author of The Failure of Capitalist Production, Pete Dolack author of It’s Not Over, and Douglas Lain, publisher of Zero Books. Sponsored by Zero Books. Commodification of Political Activism in Iran: o What is political activism? o How we can conceptualize commodification in general and specifically in political activism as a use-case? o What is the impact of commodification on reproducing revolutionary subjectivity? • Human Rights Discourse o How can we deconstruct the dominant human rights discourse in general? o What are the impacts of the dominant human rights discourse when it comes to the global South, particularly in the Middle East? • Human Rights Industry in Iran o How can we conceptualize the human rights industry? o What are the features of the human rights industry regarding the current situation in Iran • Commodification of Public Spheres in Iran o How we define public spheres? o How one can distinguish commodification from privatization in public spheres in so-called developing countries like Iran? o When we talk about commodification in Iran today, what are the signifiers? What are the elements of resistance? Speakers: Soheil Asefi, Dept. of Politics-New School, journalist and former political prisoner; Arash Kia, scientist and left Iranian activist; Andrew Kliman, author of Reclaiming Marx’s Capital. Note: MHI will not have an exhibit table this year. Don’t confuse others with us. If you wish to meet us, come to these panels or email us before the conference to arrange meeting. ADDED JUNE 7, 2016: VIDEOS OF THESE PANELS NOW APPEAR HERE.